As Abandoman (Rob Broderick) brings his hit mash-up of comedy and musical genius to The Leadmill's stage on 21 November, we caught up with the guy to get to grips with what to expect, and how he came across his unique talents. You’re set to return to Sheffield as part of your Pirate Radio tour this month. What do you like most about the Steel City? There’s a lot to like. One thing that really hit me is the graffiti art pieces around the city. On the last tour, I remember Sheffield and Bristol particularly standing out. I always try to spend some time walking around the city on show days and this was something that really stood out. From a casual bit of research, the artist Phlegm seems to have work close the venue (The Leadmill) that I’m looking forward to seeing this time. How did you get into this career, it being such a niche and one-of-a-kind thing? With the help of Jonzi D, who’s the director of Breakin’ Convention, an international hip hop theatre and dance festival. Jonzi was running workshops in London for people involved in any aspect of hip hop culture, with the majority being either rappers or dancers. I went to audition for the workshop and ended up freestyling with some amazing London MC’s. As the workshops continued, Jonzi encouraged me to freestyle all the sections of the workshop that I was involved in. It was something I loved doing and it found a bit of a home in that environment. At the end of a week of sessions, we performed pieces we’d worked up for a fairly big audience. It was my first time bringing hip hop and comedy together (previously, I’d been performing stand up and writing songs, but kept both very separate). I loved the process of riffing with an audience and then creating songs based on those chats. At the end of the workshop week, I was pretty sure this was something I wanted to continue. What’s the most random thing you’ve found yourself rapping about? Without a doubt, one of the most surreal nights was when four soldiers came to a show around New Years’ Eve to celebrate one of them getting a new prosthetic leg. They’d seen the show a few years earlier, around the time one of them had lost their leg, and had come to celebrate the new leg’s anniversary. The leg in question had been created to look like it contained an aquarium (he loved fish). When I started chatting with them, I was conscious that this is something that could be particularly sensitive but they were all incredibly keen to be as involved as possible and that this was a celebratory night. Over the course of the evening, they kept on trying to get the leg in the show, into pretty much every song. The show finished with the soldier with the prosthetic leg doing the splits onstage (I must emphasise, this was very much an idea he’d brought to the table) - the audience went crazy for it. The whole room felt incredibly involved in their story and half the crowd hung out afterwards for drinks. What do you do to warm up before a gig? I freestyle for about 30 minutes backstage. Just making sure the head is warmed up for the show so I can hit the stage with a bit of focus and feeling ready to create songs with the crowd. Have you noticed anything different about your Northern audiences in particular? I must confess, I find the biggest changes are the physical environment of the venue, rather than the exact location of the show. When people are close to the performance, I find they tend to get more involved and give better suggestions. The best shows are when the audience are almost onstage. I think every city tends to have great audiences, the job of the performer is to allow them to relax, particularly with a show that involves so much audience interaction. What’s been your favourite moment so far on this tour? The show involves me asking the audience very specific questions to inspire ideas that they can bring to the table, and hip hop songs are then created from what they give me. There’s no pressure to have a big story, small little moments always work brilliantly. That said, in Manchester, a lady from Northern Ireland told perhaps the best story I’ve heard to date, one that was lengthy, dramatic and genuinely could be a Netflix special. It was the story of her as a child trying to get out of an Irish dancing class with a fictional excuse that was so big, involving the political situation at the time in Northern Ireland, that police, school and newspapers all had to get involved. In the end, despite newspaper articles about her fake plight, she still had to do her Irish dancing classes. It was epic. At the end of the song about her story, she, and the other people who were onstage with her, broke into a bit of Irish dancing - one of my favourite endings to a show. Have you tried Henderson’s Relish? If not, you must! I haven’t and this is the second time someone has asked me this this week (shout out to the BBC Sheffield Breakfast team). I really need to get on it! 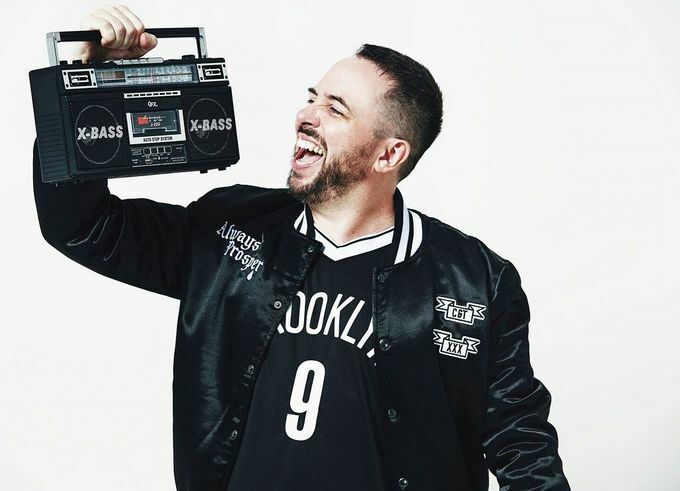 Abandoman will bring 'Pirate Radio' to The Leadmill on 21 November at 7pm. Tickets can be found here, or by calling 0114 272 7040.